A joint House-Senate committee that will look at how agencies at all levels in the state handle cases of child abuse and neglect has held its first hearing. The body has decided to split into several subcommittees that will each study a set of issues related to such cases. 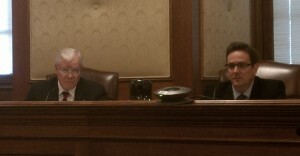 Representative Bill Lant (R-Joplin, left) is the vice chairman of the Joint Committee on Child Abuse and Neglect and Senator Kurt Schaefer (R-Columbia) is the chairman. Its chairman, Senator Kurt Schaefer (R-Columbia), says that means looking more at the court system, law enforcement, the foster system and more. The topics the Committee discussed dividing between subcommittees were the handling of abuse and neglect reports, the staffing, handling and policies of children’s services, the technology used by related agencies, the foster care system and the removal of a child from a home.